Wowie. I can't believe the year is flying by and we are almost in August. My youngest 2 kids go back to school in 3 weeks. Yikes. I'm not ready for that yet. 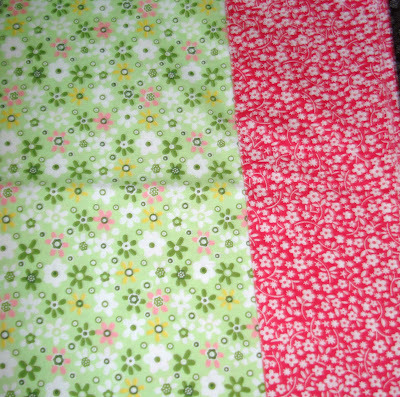 Flora brought me a little present of this Heather Ross fabric sample set. 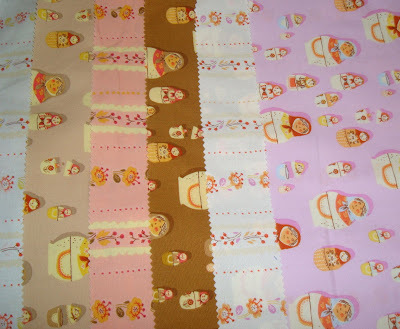 This is fabric I've always thought was very cute and of course I love the matryoshkas. Thanks Flora. I'll probably fussy cut this for lots of things. I think the matryoshka in the window of a cottage would be cute. These 2 Japanese prints are similar in color and texture I think. I really like fabric with words and symbols on it. More fussy cutting! This is very unusual fabric. You might want to click the picture to make it bigger. Very strange. I can't decide if it is for lots of seasons or just for Valentine's because there what appears to be Christmas trees in some of the squares but also a lot of Valentines. What do you think? I gotta say the face and expression on the Cupie girl is disturbing. Almost creepy. 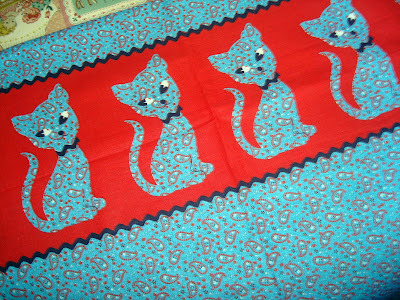 But I'm going to use this fabric no matter what. And this selvage is a keeper. I don't only use Japanese and vintage fabric ya know. Well, mostly I guess. But I'm making a quilt for my grandnephew and decided to use some of these domestic travel/vehicle fat quarters I had in oranges and blues. More on this next week when I get further into the project. 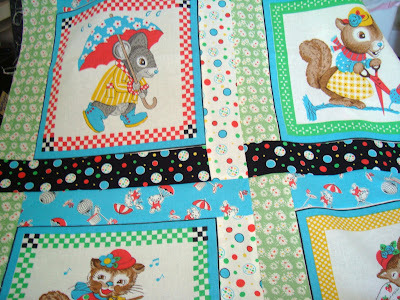 This vintage kitty print looks perfect for a little girl quilt, don't you think? Another one I hate to cut up. I love border prints. These 2 mini prints just happened into my stash. I think they are delightful. But enough about fabric. I have stuff to do. I'm busy with so much this weekend. and this. 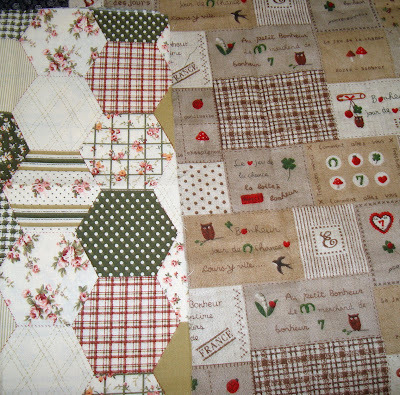 I have to hurry because next weekend is the Alpine Days Quilt Show and I would love to enter these in the show with some other quilts of mine. It isn't a judged show. It is just for fun. The best kind. 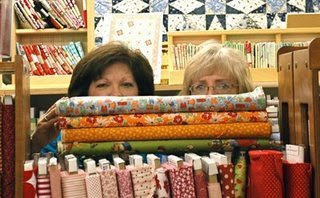 I thought I would split the Tuesday night quilt group into 2 posts. This post is about the show-n-tell. Part II will be Monday. I'm going to spread out the fun. 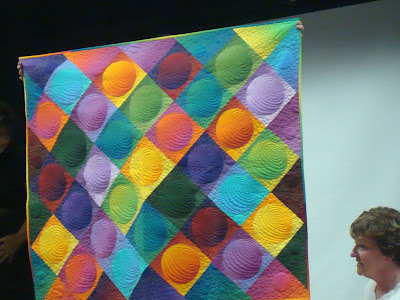 These quilts are from members of our wonderful group. 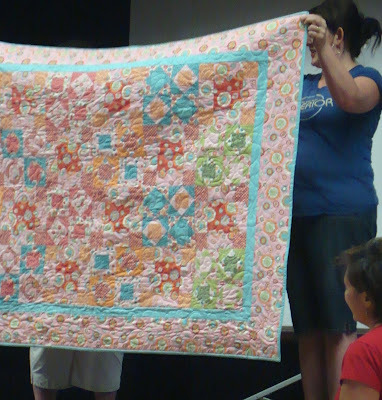 I am way to busy taking pictures to write down names and creators of quilts during the meeting. So just enjoy with no commentary. Except I will say this quilt from Flora speaks to me. Love it. 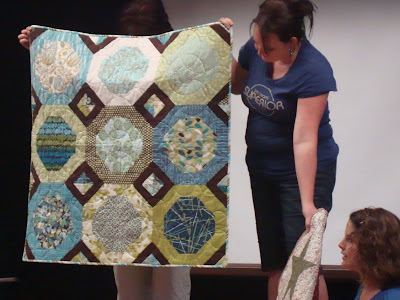 And I really enjoyed this quilt so much. 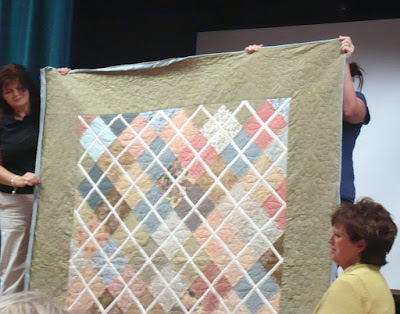 Look at the quilting! 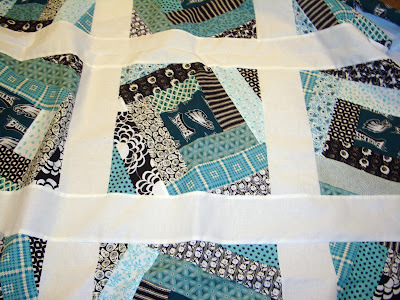 It is inventive and perfect for this beautiful and simple quilt. 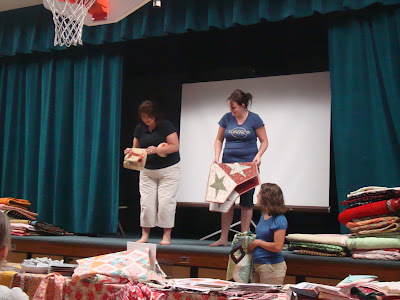 It was a really fun night with the gym full of quilters and wonderful quilts. I am so happy to belong to a group of fun and talented ladies. Thimbleanna was one of the first blogs I started reading more than 2 1/2 years ago, well before I even dreamed of having a blog myself. I was impressed by her talent, wit and ability to connect with other women like myself. In fact Thimbleanna, PamKittyMorning and LizzyHouse were some of the first blogs to inspire me. And they still do. Last week Anna came to visit her family that live around my local area and I was hoping to get to meet her along with our friend Kim. Unfortunately I had a very busy week at work and it was impossible for me to break away to be with them. I was so disappointed. 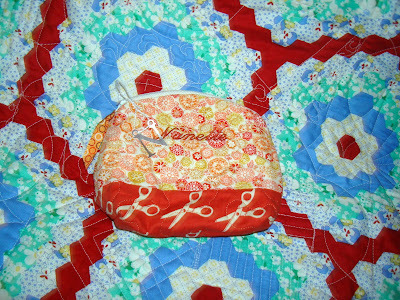 Last night I sat by Kim at our local quilt group Kim brought me this wonderful gift from Thimbleanna. What an incredible surprise!! The little zipper bag is made with every attention to minute detail. I love it. It was wrapped up so sweetly with a ribbon and an N charm. Sigh. Typical Anna - small touches that make things so perfect. The darling bag with beautiful fabric has my name on it! Don't we all just crave things with our names on them? That love must go back to grade school when our name had to be on anything and everything from our ruler to our snack. I looked inside the bag and there were treats!! Yes treats for a quilter. Nice nice treats. Thank you so much Anna. Those are incredible scissors! Scissors make my heart beat fast . I couldn't stop from fitting my fingers around them and experiencing that sensual sensation associated with snugly fit metal and a pointy tip! (I know I'm getting creepy but it is true. 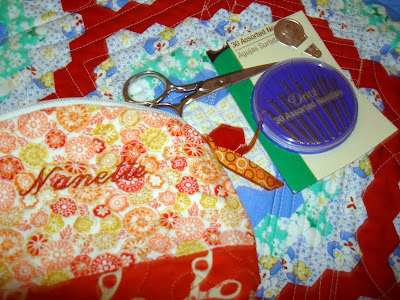 Admit you know what I mean) Those scissors will be lovingly used along with the needles as I keep them both in my little To-Go Nanette bag you made me and tuck them along with me when I go anywhere. Next time you are in town I will not miss the opportunity to meet you. It has been such an incredibly busy summer and I feel like I'm missing so many things I want to do. I love my surprise gift. Thank you again, so much. When I was in Star Valley for vacation earlier this month I brought home a few UFO projects from my sister Michelle. A few years ago Michelle and one of her sister-in-laws embroidered these blocks. And they need to be completed, they are so cute! 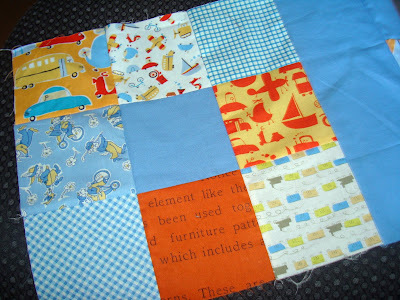 I have a few ideas of things I can do to make a little quilt out of the blocks. 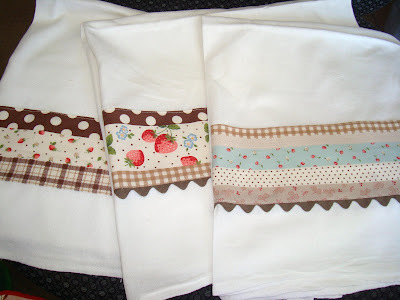 It will be fun and easy with reproduction fabrics and a vintage feel. 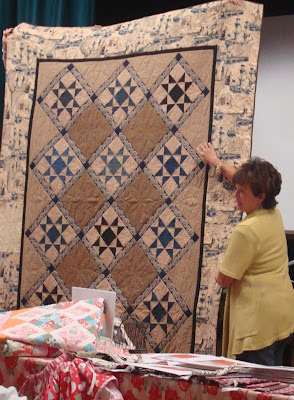 Michelle also had a quilt she had started to make but with no outer border. 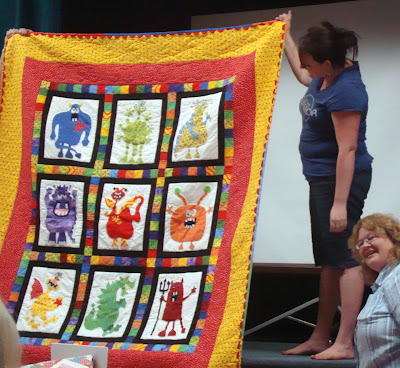 I told her I'd finish it up for her and take it to the machine quilter when it was done. The blocks are from a panel that she cut apart. We both felt it would be best to border the quilt in the black with the bubble dots. She ran out of the black dot fabric and I don't know what the fabric is called or where to start looking for more. Come on you fabric hounds. What is this black bubble dot fabric called? Anyone? I'm going to look around a bit but if anyone knows off hand I'd appreciate the info and I am sure I can pick some up online. 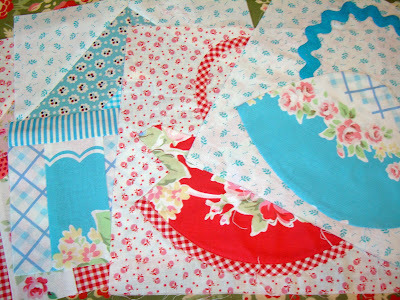 It was kind of a busy weekend and sewing was not the main event for me. Unfortunately. I made some quick gifts to go with homemade bread I made today. Those flour sack towels come in very handy when you buy them in bulk. I used some of my Flower Sugar fabric for a table topper out of the pattern I'm developing. 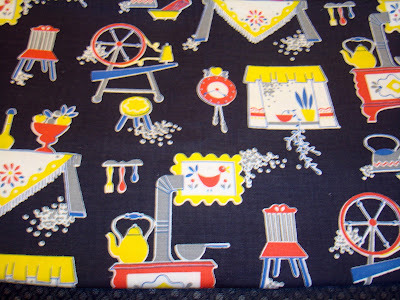 Has anyone been able to buy this fabric anywhere yet? It is so beautiful. 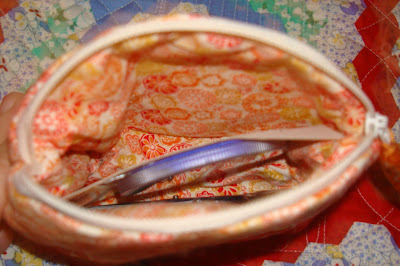 I've enjoyed using it so much and when I cut into it I get fabric anxiety worrying about running out. I've got the rest of the work-in-progress cut out in the green color way. I can't decide which print/color I like the best. They are all so yummy. 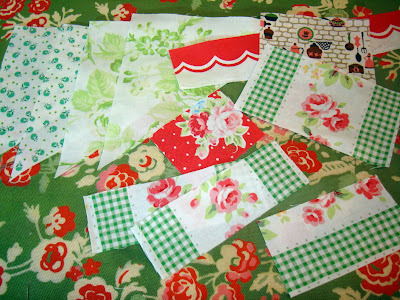 Material Girls was having a sale on fat quarters this weekend. 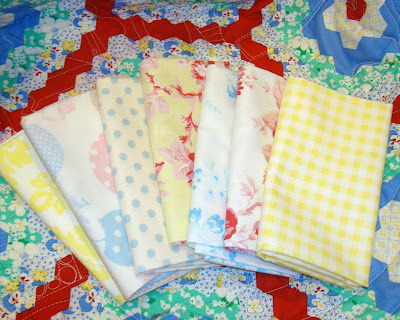 I had to take a couple quilts up to be quilted so I picked out a few little pastel beauties. Nadine is always so welcoming and nice when ever I visit. It is such a great shop. Can you believe it is the last week in July? 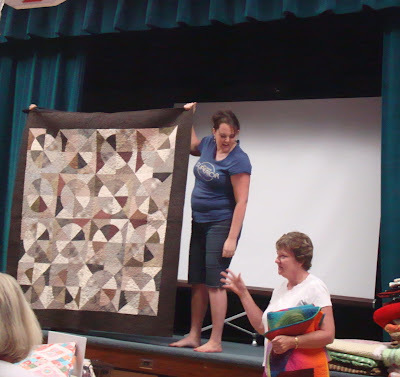 Alpine Quilt Night is tomorrow night. Can't wait. 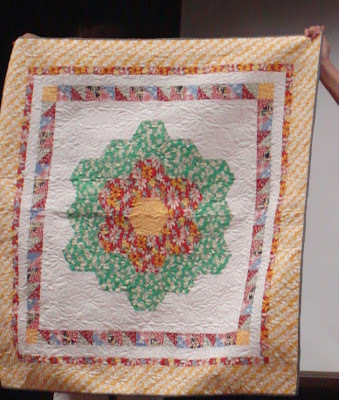 Do you know Lurline from the quilting world down under? If not, you should. Definitely. 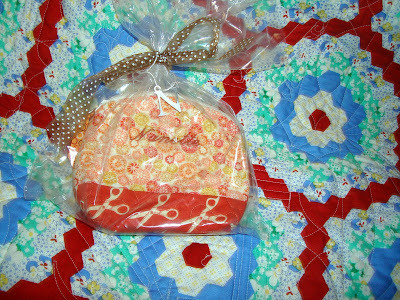 The very sweet and talented Lurline sent me a lovely gifty this week. Unexpected really. 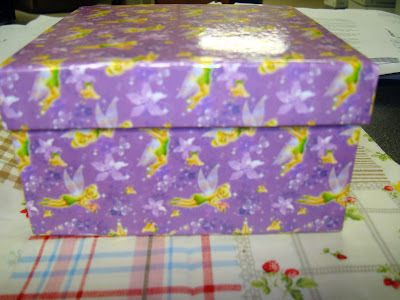 She blogged about making it for a special someone but I dared not to hope it was me. 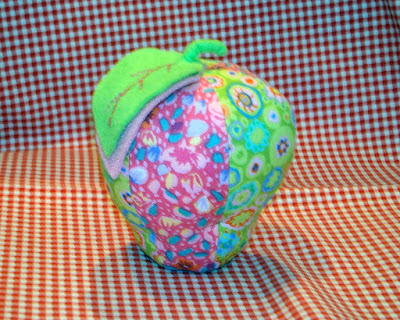 Lurline has been making wonderful pincushions and showing them on her blog. I've been admiring them. And she sent me this Pink Lady! What a beautiful apple. Thank you so much Lurline. 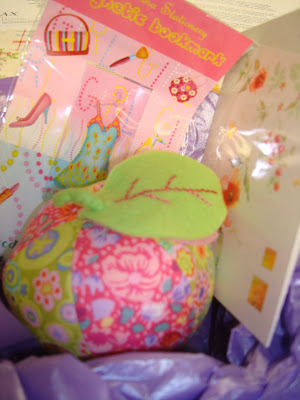 It has a very special place on my little display of pin cushions I love too much to stick with pins! 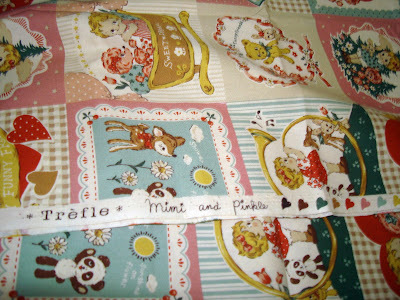 Lurline makes wonderful stuff. Go say hi to her. 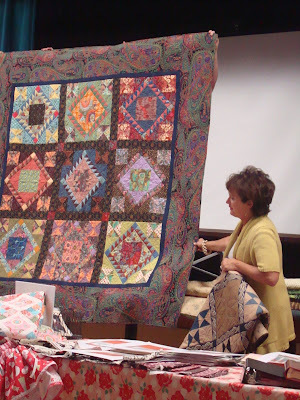 Those quilters down under are so incredibly talented. 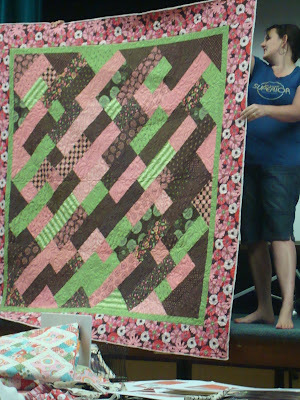 Lurline is involved in an amazing block of the month. To kick off my Fabulous Fabric Friday I wanted to show you some little bits of fabric that I am using for a wedding quilt for a very special girl. Shhh. I would show you more but it is too lovely to expose too much too soon. I purchased the fabric on the bottom of the pile from Kimberly. 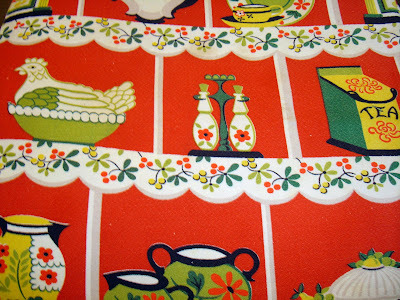 She has a great vintage fabric online shop. I go there just to browse at least once a week. Everything is tempting. Kimberly also has a blog. A wonderful blog. 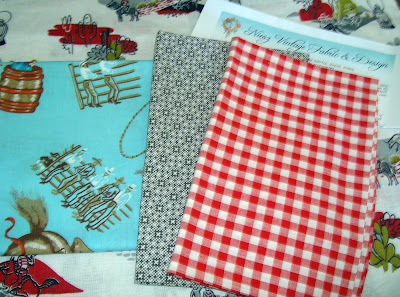 And Kimberly very generously sent some fabric gifties along to use in the quilt for the bride and groom. Thank you so so much Kimberly. If you only knew how many times I looked at the fabric before getting it! 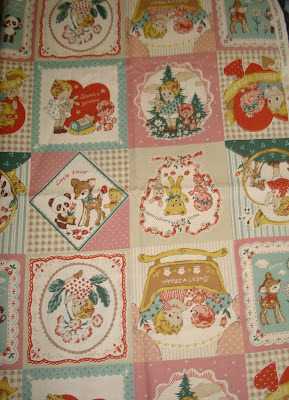 Another gifty to show for FFF is this winter village scene from . . . who else? Flora! 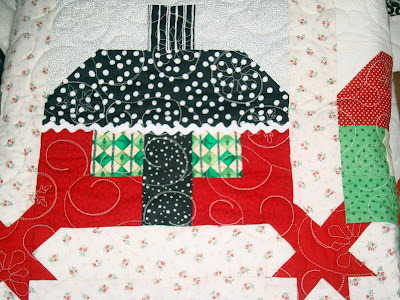 I have one more project to make with my left over Christmas cottages. 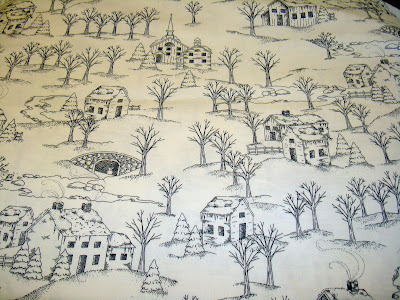 And I'm going to use this winter scene fabric. Thank you Flora! I'm going to be really sad to finish my Christmas exchange block projects when I am done with them. But when I get them out at Christmas think of how happy they will make me. 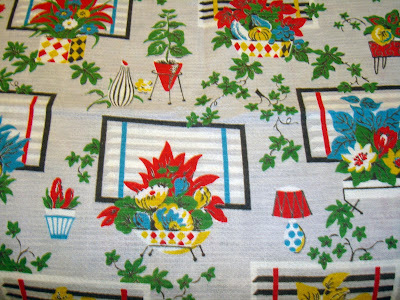 Now I have more vintage fabric to show for FFF today. 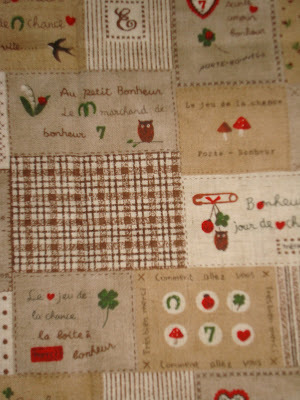 This is some fabric I got from Donna Flower when she had a sale last month for past customers. 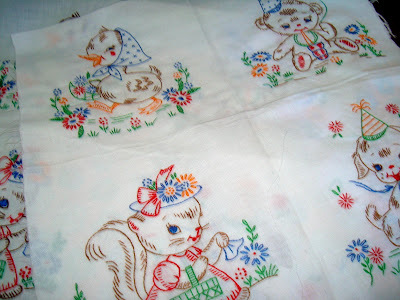 I allowed myself some vintage extravagance because I am planning pattern projects around them. Here is another Donna Flower find. Can you believe this! 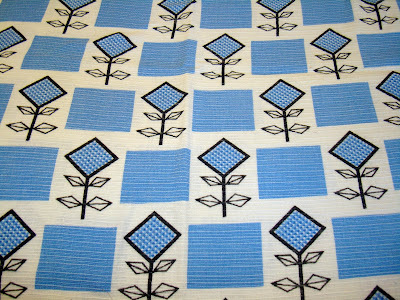 I've also been visiting this fabric regularly before snatching a bit. More vintage Donna from her sale. I wouldn't of course, but I would wear this fabric every day I love it so much. Does anyone remember me complaining that I was out of this fabric? 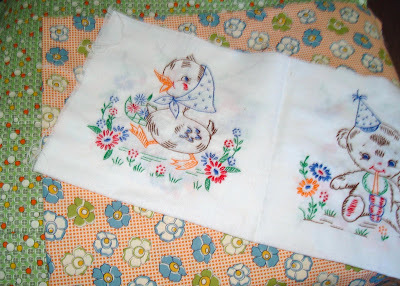 It is vintage fabric I've had for quite a long time. I've used it in project after project. Well this is really a new piece of this fabric. It isn't in as good a shape. And it is a different texture - more of a bark cloth than a cotton. Not quite as nice as its lovely sister from my stash. But I'm not complaining because I got it on the super cheap. Right after I said "wah I want more". I found it! Sometimes we are just in the right place at the right time and this was it. It is a little worn, but still in very good condition. Now I hate to cut into it! 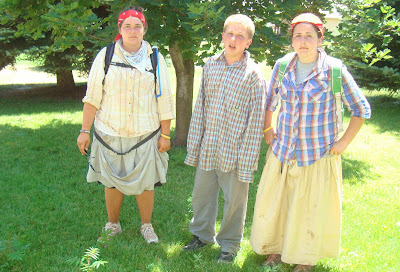 My gosh I hope my kids don't see this "after picture" from their pioneer trek posted on our blog. They will kill me. Candace told me not to miss the opportunity to get an "after picture". Thanks so much for the advice Candace. Someday they will thank me for capturing the moment, I'm sure. Some of that color is sunburn but most of it is dirt. You should see their feet. I took pictures so they could remember. 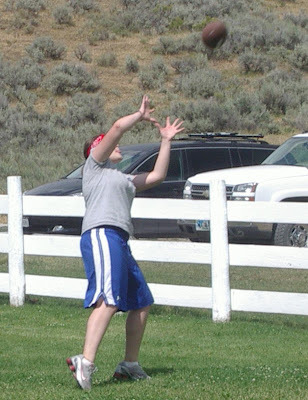 I have to tell you I was worried about blisters in Mason the most but he didn't get any. And he trained in his new shoes the least. Laurie and Jamie had so many huge blisters I couldn't believe it. And Laurie has a huge sunburn blister on her ear. They had a good time though and it was a very growing experience. They cannot understand how pioneers could walk like that day after day after day after day from the Midwest to Utah with only as much food per day as big as a fist. The kids showered, ate and promptly all fell asleep. Today is Pioneer Day in Utah. It is a state holiday when we remember the sacrifices of those that went before us to create a lovely state to live in and a rich heritage. I have a precious pioneer heritage on my mother Freda's side. Here is a photo of my grandparents, Peter and Delecty Freda's parents. And here is a photo of Delecty (my grandmother) and her family. Delecty has her arm on her mother's shoulder. It was Delecty and Peter's families that made the long trek west. I'm very grateful my my kids had a chance to appreciate that for a few days. Here are my 3 youngest kids below. No we are not polygamists. I want to make that perfectly clear up front before anyone goes further in this post. Again, I repeat, we are not weirdos or polygamists. Left to right Jamie (18), Laurie (16) and Mason (14). My kids are gone all week at something called "Trek". It is a pioneer reenactment (of sorts) to teach kids about sacrifice and other values sometimes missed in our day-to-day culture and society. It is a time for kids to shut out the world and remember our ancestors and connect for just a few moments with the lifestyle that made the west and our country what it is. I thought the picture I took of them I took at 7:00 AM on Monday morning was cute (right before they left). 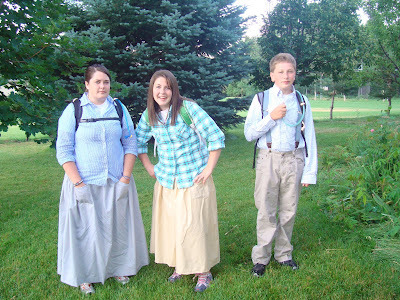 We made their skirts and Mason is wearing Mr. Hive's suspenders. You get the idea. They are with hundreds of other kids and local church leaders in Wyoming on a very organized event and will end up walking 34 miles pushing handcarts and having hopefully a very positive experience. However, I guarantee you that those skirts will never be worn again when they get home. 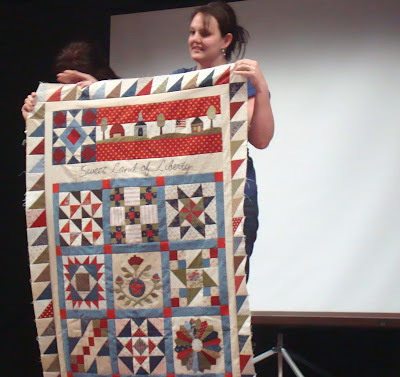 Here is Jamie above and my point in all this is my kids are away so I can talk about Jamie's high school graduation quilt. Yes, I know it is the end of July. 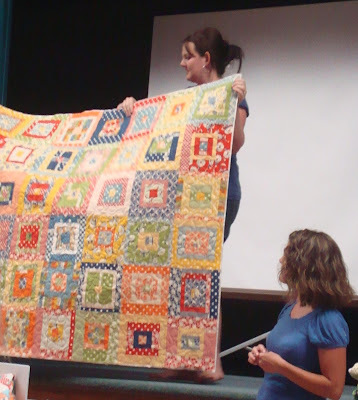 And I haven't yet blogged about the high school graduation quilt I owe Jamie. She graduated in May this year and so the quilt is slightly overdue. And here is why. Above is typical Jamie. And this is Jamie's room. Can you tell Jamie loves football? 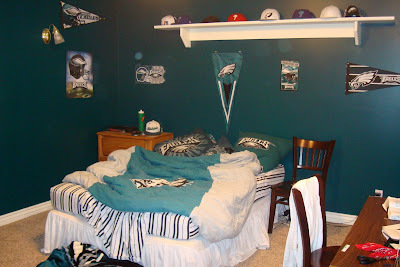 Can you tell Jamie is the Philadelphia Eagles #1 fan? I shudder every time I see that paint on the walls of her room in MY HOUSE! Mr. Hive let her do that, not me. 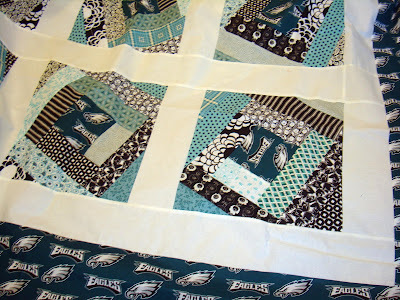 So Jamie wanted, of course, Philadelphia Eagles fabric in her graduation quilt. I was less than excited. A lot less. 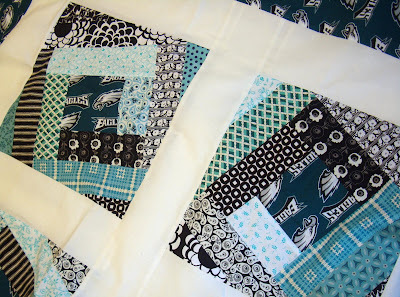 Her Eagles fabric has been sitting here and I've been really trying to make something that is about Jamie but something I could stand to sew! So I shopped for fabric prints in black, gray and Eagles green. Without enthusiasm I might add. After much agony and indecision I thought I would make a wonky quilt. Eeeek I said that word! I channeled Jacquie of Tallgrass Prairie Studio. I went to her blog and looked at her archives. And this is what I came up with. 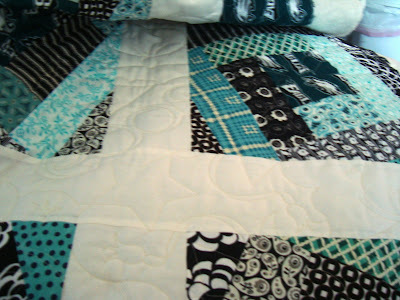 It isn't fabulous like Jacquie's quilts but I felt that I captured some modern flavor and some unity with the fabrics. 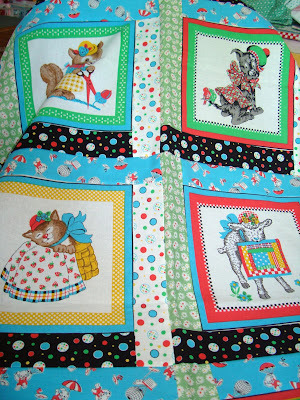 I still don't really care for the quilt but you know what they say "It will all quilt out just fine". I hope. Well it's off to the quilter, so we'll see.